Swansea away is one of very few games for which I don’t need to travel through London, but it was still an early start to get to Reading to pick up the train. As I boarded, I spotted a couple of our regular away travelers, so was treated to some unexpected but very welcome company for the trip to Wales. As we left Reading, the sun was in my eyes but the fog soon descended and, added to the fact that it had been bitterly cold on Reading station, it looked like we were to be in for a very unpleasant day weather-wise. Due to engineering work on the railways there were no trains running to Swansea, so we were turfed off the train at Port Talbot. While the term ‘rail replacement’ is usually met with dread, the arrangements on this occasion went rather well with a bus waiting for us that ran straight to Swansea meaning that we arrived 20 minutes ahead of schedule. Even better, the weather had improved considerably and we arrived to bright sunshine. I parted company with my travelling companions on Wind Street to make my way to my party’s chosen pre match venue. On arrival I was delighted to discover that it was an old-fashioned pub populated with locals which served decent beer and properly home cooked food and, bizarrely, had the cricket on teletext on the TV in the bar. After a very pleasant lunch, we set off along the Tawe for a lovely walk to the stadium. Team news was that Mazzarri had made two changes with Zúñiga and Ighalo in for Amrabat and the injured Success. So the starting line-up was Gomes; Kaboul, Prödl, Britos; Zúñiga, Pereyra, Behrami, Capoue, Holebas; Deeney and Ighalo. It was Bob Bradley’s first home game in charge at Swansea, so there were concerns that we may fall victim to the boost that a new manager often gives a team. He was certainly making his mark with five changes from the Arsenal game. Before kick-off, there was a minute’s silence to commemorate the 50th anniversary of the Aberfan disaster. I was very young indeed when it happened, but it still made a strong impression on me and, as an adult, the thought of a town losing a whole generation of children is beyond heartbreaking. The silence was observed impeccably and it was good to see both teams wearing black armbands. The first half was pretty dull. The home side had the first chance with a shot from Barrow that, from our viewpoint, appeared to have flown wide, but the referee believed that Gomes had made a save, so awarded a corner. The next chance of note came on 22 minutes as a terrible ball from Behrami allowed the home side to gain possession and Sigurdsson unleashed a shot that was stopped by a flying save from Gomes. Watford’s first shot came just before the half hour when Capoue won a free kick, which he took himself just clearing the bar. Capoue also had the next shot with an off-balance volley that was nearer to the target than it had any right to be. Late in the half, a terrible clearance by Fabianski hit Deeney, but Troy was taken by surprise and wasn’t able to take advantage. 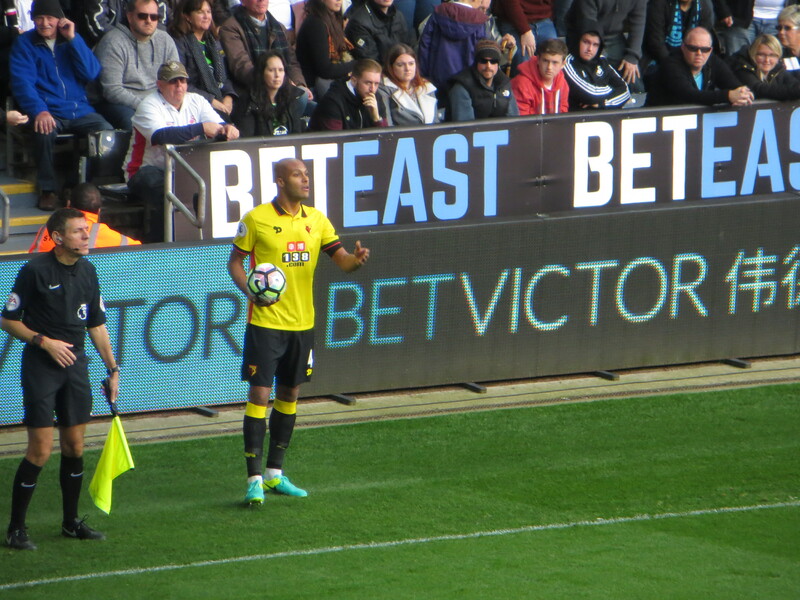 Just before half time, Capoue played a short free-kick to Kaboul who hit a shot that rebounded off the wall. The first card of the game went to Capoue for a foul on Routledge which consisted of him lifting the player off the ground. The offence was almost as hilarious as Capoue’s outrage at being penalized. So we reached half time goalless. 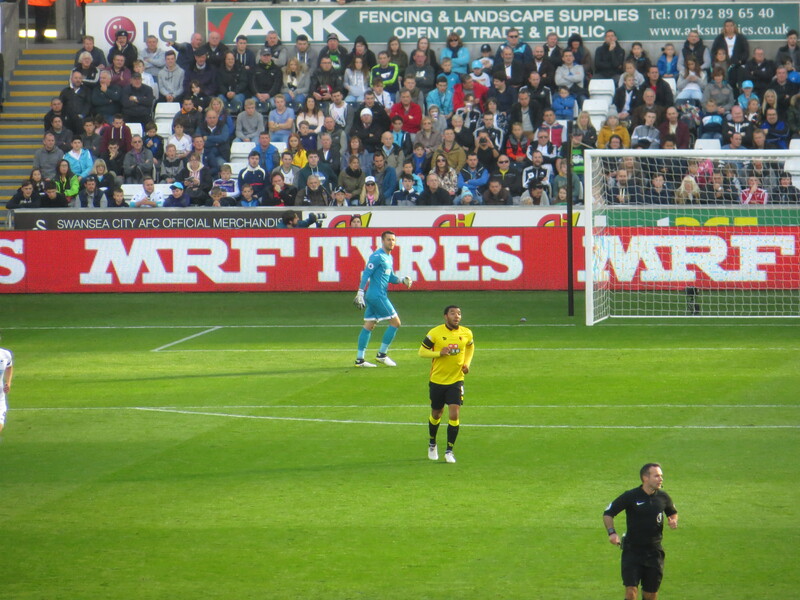 Swansea had started the half the better team, but the Hornets certainly had the upper hand later in the half, although they didn’t test Fabianski in the Swansea goal. 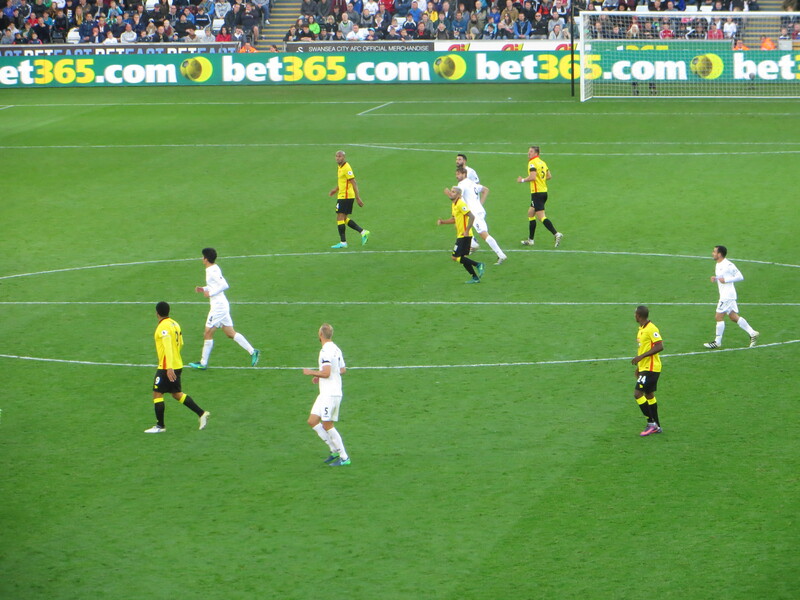 At half time, I noticed that the banner display around the pitch was showing positive facts about Swansea in head to head matches against Watford. The one that particularly caught my eye was that the last time they had failed to score in a home game against Watford was in March 1923. Early in the second half Sigurdsson was shown a card for pulling Pereyra back. Ten minutes into the half Capoue played for a free kick, as he appealed in vain, Swansea went on a break which finished with an acrobatic kick from Borja that flew wide of the target. Deeney and Ighalo combined to find Capoue in space, but the Frenchman hesitated as he looked to the lino for an offside flag and the chance was lost. Just before the hour, Ighalo went on a run into the box and executed a trademark Iggy Scoop but, instead of shooting, tried a second scoop and his shot was blocked, the ball dropped to Pereyra in the middle of the box but he got it caught under his feet and couldn’t get a shot off. Mazzarri made the first substitution of the game bringing Amrabat on for Zúñiga. This was a brave move in an away game as he was sacrificing defence for a more attacking player. On 64 minutes there were cheers from the home fans as they thought that van der Hoorn had turned a Sigurdsson free kick home, but a terrific save from Gomes kept the score goalless. Bradley’s first change saw Llorente come on for Routledge. Holebas gave away a needless corner which led to a scramble in the Watford box, but the clearance allowed Amrabat to break before he was stopped by a pull from Britton who was booked for the foul. Amrabat went on another break before playing the ball to Ighalo, there were appeals for a penalty as Naughton appeared to handle the ball, but nothing was given. 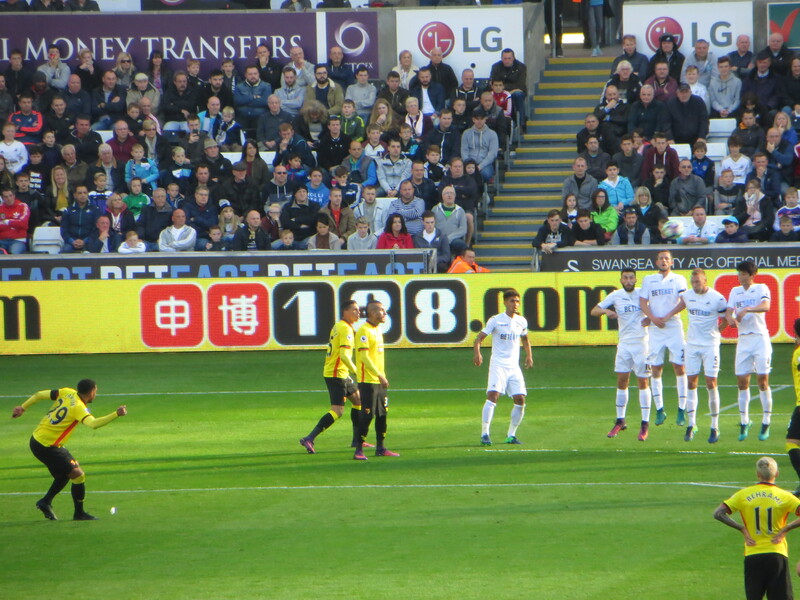 At the other end, Swansea threatened and Gomes had to drop to save a snap shot from Sigurdsson. Watford had a second appeal for a penalty soon after as Behrami appeared to be tripped in the area but, again, the referee wasn’t interested. 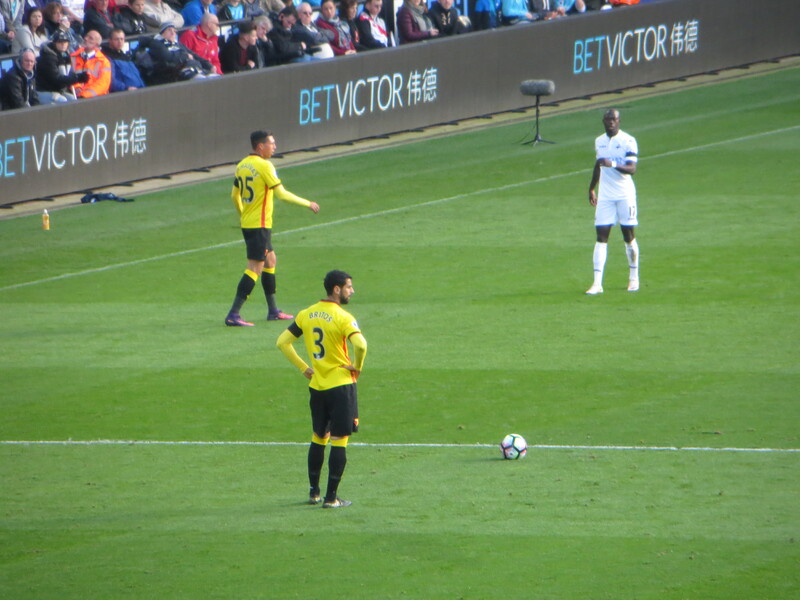 Mazzarri’s second substitution was to replace Capoue with Guedioura. Kingsley should have done better for the Swans when the ball found him in space in the box, but he swung his foot at the ball and missed. Not for the first time that afternoon the claims for this division being the “Best League in the World” looked ridiculous. The hosts should have taken the lead as a promising break finished with a shot from Sigurdsson that rebounded off the post with Gomes beaten. There was frustration for the Hornets as a cross from Amrabat was chested down by Ighalo in the box and the whistle went for hand ball from a referee who had a considerably worse view than we did. Watford had a terrific chance for a late winner as Ighalo played in Amrabat whose shot was just over the bar. On the stroke of 90 minutes Naughton tried a weak shot that was straight at Gomes. In time added on, Guedioura hit a cracking shot but it was straight at Fabianski who made an easy save. So the game finished goalless and Swansea failed to score against Watford at home for the first time since 1923 (talk about tempting fate!). All in all, it had been a lively match which was sadly devoid of goal chances. Swansea’s Barrow was the pick of the players, a constant menace on the wing but there was no outlet for him. For the Hornets, I thought that Holebas was the pick of the outfield players, and Gomes has to be credited with preserving the point. Whatever Swansea’s current position in the table, a point there is a decent result and is an improvement on our performance and result last season (I distinctly remember leaving the ground and meeting someone who told me we’d definitely be relegated now). I am happy to report that the return journey went without a hitch and, again, I was fortunate to bump into some lovely Watford people who considerably enhanced my trip home. This entry was posted in Watford FC and tagged Adlene Guedioura, Alfie Mawson, Bob Bradley, Etienne Capoue, Fernando Llorente, Gonzalez Borja Baston, Gylfi Sigurdsson, Heurelho Gomes, Jose Holebas, Juan Camilo Zuniga, Ki Sung-Yueng, Kyle Naughton, Leon Britton, Lukasz Fabianski, Miguel Britos, Mike van der Hoorn, Modou Barrow, Nordin Amrabat, Odion Ighalo, Roberto Pereyra, Sebastian Prodl, Stephen Kingsley, Swansea City FC, Troy Deeney, Valon Behrami, Walter Mazzarri, Watford FC, Wayne Routledge, Younes Kaboul on October 24, 2016 by franelynn.